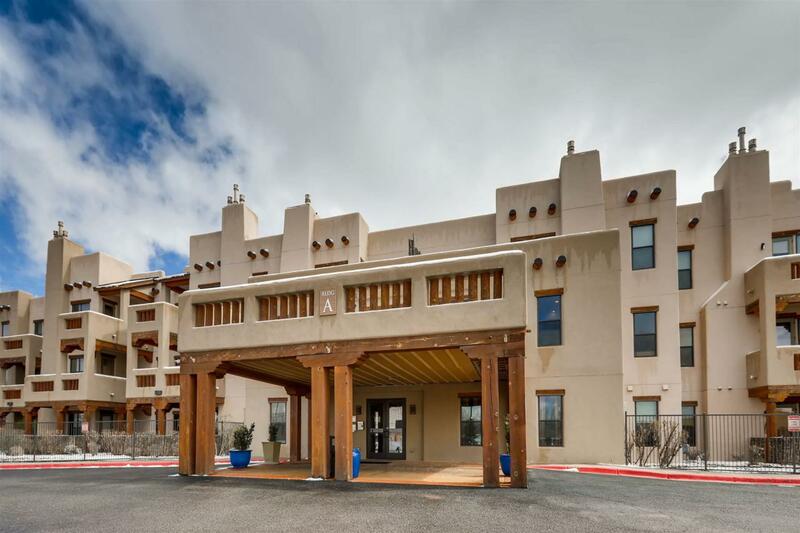 Ask for luxury and you will receive it here just 12 minutes from the Plaza in the Santa-Fe style Alameda Condos! This spacious floor plan, two bedroom two full bath, 1284 sq. ft with high ceilings overlooking the pool area comes with a single-car garage and 5 X 12 X 10 high storage unit right next to the condo. 24 hour controlled access environment with beautifully landscaped courtyards and pool area with elevators. . Youll appreciate the private partially covered balcony next to the living room with its gas-fired kiva fireplace and viga ceilings. Along with a washer and dryer comes the kitchen with black granite counter tops, stainless steel appliances and stone tile floors. The master bedroom has both an enclosed shower and a jetted tub. Both bedrooms have walk in closets. Other amazing amenities are the The Fitness Facility, Pool Facility, Wine/Meeting Room, Kitchens and other Common Element amenities all close by and down the extra-wide corridors. It is a wonderful place to call home. With Starbucks, Movie theaters and restaurants across the way - Welcome to the Alameda! Assessments And Other Fees $ 473.50 Per Month - includes Basic Cable Tv Grounds And Pool And More - See Documents Attached. Listing provided courtesy of Victoria Warner-Stratton of Santa Fe Properties. © 2019 Santa Fe Association of REALTORS®, Inc. MLS. All Rights Reserved.